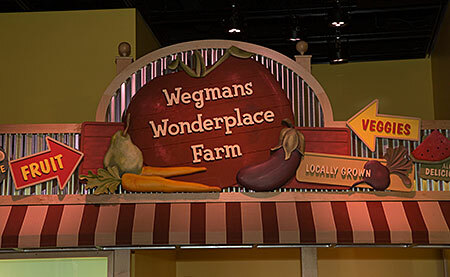 Wegmans Wonderplace welcomes curious kids ages 0–6 and their grownups to exercise their imaginations, wiggle their bodies, and explore with their hands. Wonderplace is built around the enduring wonders of childhood, the things kids are naturally curious about—blocks, animals, sounds—and branches out to make connections to the museum’s diverse collections and exhibitions. Our youngest visitors will cook their way through a kid-sized Julia Child’s kitchen, find the owls hiding in the Smithsonian Castle, and captain a tugboat based on a model from our collections. Through playful activities and creative displays of treasured artifacts, young children will get to know the faces, places, and stories of our country in engaging and age-appropriate ways. Wegmans Wonderplace will be a launching pad for a lifetime of learning! Wegmans Wonderplace is open every day, except Tuesdays and December 25, from 10:00 a.m. to 4:00 p.m. We welcome visitors to explore our hands-on, self-directed activities on a first-come, first-served basis. Facilitators and docents are available to assist, engage, and experiment with our visitors, but are not responsible for supervising children. Please also note that children may not visit Wegmans Wonderplace without an adult. On weekends and federal holidays, we use FREE, timed tickets to minimize wait time. Tickets are available for 30-minute visits on a first-come, first-served basis. No tickets are required for the first session from 10:00 a.m. - 10:30 a.m. To visit during a later half-hour session, visitors may pick up a ticket at Wegmans Wonderplace in 1 West. The last entry is at 3:30 p.m.